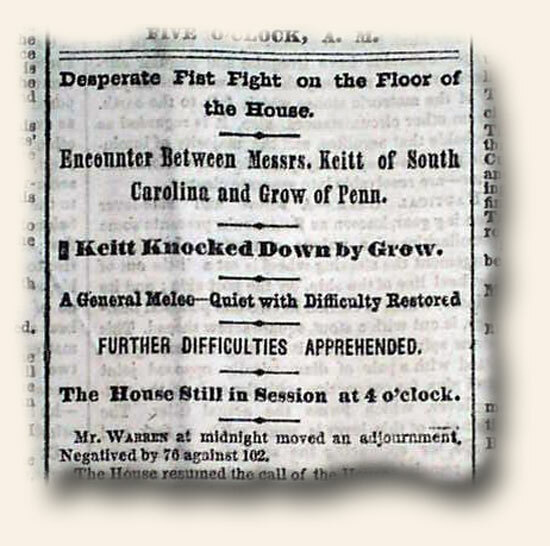 “The New York Times” of February 6, 1858  reports a brawl on the floor of the House of Representatives the day before. Although perhaps not as infamous as the Charles Sumner/Preston Brooks attack, this one between Lawrence Keitt and Galusha Grow was more raucous. 1 Comment To "A Three Stooges skit on the House floor…"
I wish the congress of the day had the passion to have a brawl. Instead they are the deficiencies in performance are well matched to their intellect.